Map 5 Eastern churches another. It was not uncommon for several communities to congregate in the same place, which tended to be a source of conflict and weakness rather than strength. These divisions went back to the christological controversies of the fifth century, which split the eastern churches into three separate allegiances, known for convenience's sake as Chalcedonian (those who accepted the council of Chalcedon (451)) and Monophysite and Nestorian (those who did not). The independent and rival hierarchies that emerged often had their centre of gravity within a particular region, but this did not mean that they were able to eliminate their rivals. The history of Christian communities in the lands of Islam normally focuses on these different churches.2 In this chapter I shall begin with a short introduction on their history and geography. However, my main purpose will be to study their main features and developments as a single phenomenon, without, of course, neglecting what was distinctive about each denomination. A Monophysite church, currently known as the Coptic Church,3 was the dominant force in Egyptian Christianity under Islam. Organised around the patriarchal see of Alexandria, the Coptic Church displayed a strongly Egyptian identity. From the eighth century onwards the patriarchs were frequently resident at Fustat, the capital of Muslim Egypt. During the two centuries that followed they abandoned Alexandria, which now lacked both security and prestige. 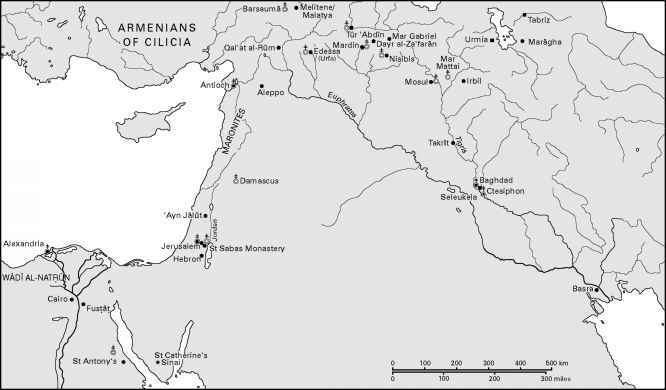 When not at Fustat they preferred to stay in different towns of the Delta or in desert monasteries. The definitive transfer of the patriarchal residence from Alexandria to Cairo occurred during the patriarchate of Cyril II (1078-92), and not, as is usually said, during that of his predecessor Christodou-los (1047-77). This step was less a matter of the patriarchs wishing to be closer to the centre of power and much more a result of the vigorous centralising policy of the grand vizier Badr al-Jamalî, who insisted that the patriarch establish himself in the capital.4 The patriarchs continued all the same to be ordained at both Alexandria and Fustat. 2 A good synthesis of this approach can be found in Histoire du christianisme des origines à nos jours, ed. J.-M. Mayeur, C. Pietri, A. Vauchez and M. Venard, 13 vols. (Paris: Desclée, 1990-2000). 3 The terms Copt and Coptic derive from the Arabic Qibt, itself derived from the Greek A'iyuvTos, which is a corruption of the Ancient Egyptian Ha-Ker-Ptah. 4 See J. Den Heijer, 'Le patriarcat copte d'Alexandrie a l'epoque fatimide', in Alexandrie médievale, ed. C. Decobert [Etudes alexandrines 8] (Cairo: Institut francais d'archeologie orientale, 2002), 11, 83-97.